You buy it in excess because you don’t want to be caught without it in the middle of a home improvement project. You have cans of it sitting in your garage for touchups or because it’s a “limited edition.” What is it you ask? Latex paint. Americans consume more than 1 billion gallons of paint every year, and in many cases, the leftover paint from projects is still usable. Recycling this latex paint is now an affordable and sustainable alternative to sending it off to a landfill. It’s also the hottest new green design trend. Specializing in fine wall finishes, California-based Metro Wallworks is the first company to launch a line of recycled paint. The new line of recycled paint consists of 15 colors and holds many advantages over buying virgin paint. In fact, using one gallon of recycled paint is the equivalent of saving 100 kilowatt hours of energy that would otherwise have gone into producing virgin paint. Recycled paint is generally acknowledged to be much cheaper than buying new latex paint. But how is the paint recycled and is it of the same quality as what you buy from the store? 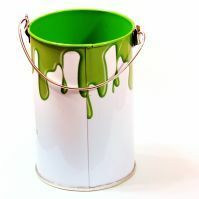 In order to begin recycling, filterable solids are removed from the paint. Most paint is then mixed with new standard paint, creating a 1:1 ratio of recycled to new paint. However, some paint is completely recycled without adding new paint. Pigments are then added to create the new color and the pH is adjusted. This new recycled paint is the same quality as virgin paint, just more environmentally conscious. To learn more about Metro Wallworks line of recycled paint, visit their web site. This entry was posted in Green Design Trends, Green News, News and tagged easy green solutions, eco-friendly, green building practices, green products, recycled on May 12, 2011 by Carol Morgan. Cutting down a tree, for many, is a Christmas tradition families could never live without. For others, plastic serves us well. But for those purists who need the thrill of hunting for the perfect, live tree, consider another option this year. Make this Christmas one Mother Nature will never forget and consider renting a recycled tree. Yes, its true...in several places around the country, and the world, people are renting live, potted trees, that can be returned at the end of the holiday season. EVERGROW Christmas Trees Company in British Columbia, Canada does just this. Their philosophy? "Cutting a tree down just for the Christmas season is a waste of a beautiful resource that is beneficial for the environment. Having an EVERGROW Christmas tree in your home will allow you to have a real tree while helping to reduce our impact on our environment." Most of us in the eco-concious community couldn't agree more. If this rental service isn't available in your area, you can always purchase a potted pine tree from your local nursery, or a tree that comes with a root ball, so it can be re-planted at the end of the season. This entry was posted in Green News, Recycling and tagged easy green solutions, going green, recycle on December 7, 2009 by Megan McLaughlin. Simple Shoes: "Shoes for a happy planet," is the slogan of this eco-friendly company. Simple Shoes finds sustainable ways to make "gazillions" of shoes. Its been about 15 years since I've even thought about Simple Shoes. When I was younger, I begged for a pair of Simple clogs for some reason. Since then, this company has come a long way. Born in 1991, Simple Shoes was created as a response to the over-hyped sneakers that were gracing the shoe scene at the time. However, it wasn't until 2004 that this company decided to change themselves in hopes of changing the world. Since then, they have introduced several collections, like ecoSNEAKS and Green Toe. These collections are super eco-friendly, affordable and fashionable! Simple Shoes is now committed to making products that are 100% sustainable, and they plan to keep it that way! They make shoes for men, women and kids and they also have a line of bags. So next time you are shopping around for a pair of comfy shoes, think Simple! This entry was posted in Green News and tagged easy green solutions, eco-friendly, eco-frindly hand bags, green fashion trends, sustainable shoes on November 9, 2009 by Megan McLaughlin. Just about everyone uses computers and a large percentage of those who do are definitely using the internet. Many people also have websites, whether for personal or business purposes, but not everyone has a Green Certified website! CO2Stats is out to change that. Now that you're reading this, you may begin to notice this little bug on many of the web pages you usually browse. CO2Stats offers green site certification by calculating the combined electricity used by computers visiting a site, the servers providing it and the networks that connect them. CO2Stats then helps to make a site more energy efficient (and load faster), and purchases renewable energy to neutralize the carbon emissions due to generation of that electricity. Pretty cool, huh? According to the CO2Stats site, "it is an easy-to-use service that makes your website carbon neutral and energy-efficient, and that provides certification that you have taken steps to make your site environmentally friendly." So if you haven't already found ways to make your website more eco-friendly, check out CO2Stats and get your site Green Certified! Its an interesting, fun way to care for the environment while bringing some green appeal to the web! This entry was posted in Green News and tagged carbon footprint, easy green solutions, eco-friendly, environment, going green, green computers on November 2, 2009 by Megan McLaughlin. You haven't lived until you try Naked Juice! It is delicious and its creators are committed to making the world a greener place! By 2010, they are planning to reduce their oil consumption by 57,000 barrels a year, which, in turn, will cause them to use 48% less energy in the process! Now for the best part - the juice: 100% all-natural, 100% juice made from the best fruits and vegetables, they never add sugar, preservatives, artificial colors or flavors! Each of their bottles contains over 3 servings of fruit and they are oh-so-delicious. This entry was posted in Green News, Recycling and tagged easy green solutions, going green, health, healthy facts, recycle, reusable containers on October 27, 2009 by Megan McLaughlin. For many of us across the U.S. and even in other parts of the world, it seems as though we have skipped right over fall and found ourselves in the middle of winter! The lack of an Indian summer has left many of us longing for warmth again already, but for others, it is a cue to start gearing up for the winter season. For plenty of people, winter means hibernation, and for sports enthusiasts, it means skiing, snowboarding and all sorts of outdoor, snowy activities. Greenzer.com provides a very informative list of ways to think green when planning winter activities. As usual, the number 1 tip involves staying local! Transportation to and from winter sport destinations like ski areas can be very costly. If you are fortunate enough to live close to winter sport destinations, keep within the area. If you need to travel further to find what you're looking for, do it wisely! The article also makes an interesting suggestion; consider the amount of carbon emissions expended to run a ski lift and to groom the trails...it would be greener to try snowshoeing and cross-country skiing! But if you just need the thrill of the slopes, be mindful of your actions and think green at all times! No matter what you decide this winter, make sure you always consider what you can do to make your life a little greener. Everyone hates being sick, especially during the cold winter months. Read this article about battling the "winter sickies." And here are some interesting suggestions about snow removal! This entry was posted in Green News and tagged easy green solutions, extreme weather, going green on October 19, 2009 by Megan McLaughlin. What do your clothes say about you? Are you always style-conscious and fashion-forward, or do you just grab the first thing you see when you wake up in the morning? Whatever your style method may be, this fall, consider adding some eco-friendly fashions to your wardrobe. It is made of cashmere, from recycled sweaters and it is fab for fall (and winter, of course)! US News had a great article about 5 Ways to Green Your Fall Clothes Shopping. Their #1 tip: “Fashion is cyclical, and that means that hand-me-downs are back in style.” This couldn’t be more true! Shop recycled/vintage and dig up some great finds by rummaging through your parents’ old threads. US News also suggests – try just not shopping at all, which is a great way to save money, too! For more fall fashion tips, check out this article about dressing green. Or this article about being fashion forward in an eco-friendly way! This entry was posted in Green News and tagged easy green solutions, fall, green clothing, green fashion trends on October 13, 2009 by Megan McLaughlin. Fall is here and the summer season has left us for good. No more trips to the beach or summer BBQs by the pool. It is bitter sweet. The warm and inviting glow of summer ends, but as the crisp, clean colors and scents of fall usher in you are still longing for a weekend getaway or a pre-holiday season retreat. Plan a fall getaway in eco-friendly style. A great place to start researching a wonderful trip is EcoTour, "your source for planning an eco holiday." Whether you're looking for a big vacation or a little 3-day weekend road trip, you can get some great ideas from EcoTour! So what is Ecotourism? According to EcoTour, "The aim of our Ecotourism Resource Centre is to act as an informative guide for users about the concept of Ecotourism. In addition, useful resources have been provided to further increase understanding & provide guidance for ecotravel." For EcoTours, many activities include getting in touch with nature; hiking, biking, mountain climbing, camping. These are some eco-friendly ways to reduce your carbon footprint while taking a break from the everyday. Even if its just for a weekend or even a day, take a quick trip to immerse yourself in some of the beautiful fall foliage the earth has to offer! Check out this site for some great, eco-friendly camping advice! This entry was posted in Green News and tagged easy green solutions, eco-friendly, green vacation on October 7, 2009 by Megan McLaughlin. Whether you have a four-legged friend or not, its great to know that there are eco-friendly pet supplies out there to satisfy everyone's pet care needs. "GreatGreenPet is a shopping blog devoted to the green, eco-friendly, pet owner. We comb the web and find environmentally friendly products for you and your pet." At GreatGreenPet you can read about pet toys, treats and pet supplies that are good for the environment and our furry friends. Their topics and product reviews aren't just limited to dogs and cats either! GreatGreenPet has advice about eco-friendly pet supplies, food and toys for rabbits, reptiles, mice, hamsters and horses, too! One of their latest blog posts highlights a recycled chew toy for dogs. According to the blog, "Planet Dog makes this recycled chewbone from materials left over from manufacturing other products. It is non-toxic, and you can recycle the scraps when your dog is done with it." Sounds like a great way to make your pooch and Mother Nature happy! GreatGreen isn't just limited to pets... they also have other blogs about shoes, travel, gadgets, baby and more where they offer advice on which great green products you should buy and where you can find them! These blogs serve as a constant reminder that its great to be green! This entry was posted in Green News and tagged chemical free products, doggie footprint, easy green solutions, eco-friendly, green products on September 8, 2009 by Megan McLaughlin. We're all familiar with Target's bright red bulls eye symbol, but does everyone know about Target's push to be a bit more Eco-friendly. Now, everyone's favorite, trendy, cost-effective and convenient department store is offering an array of Eco-friendly products. Still affordable and smarter than ever, Target has been turning very greener every chance it gets. Online shopping is super quick and easy at Target.com and this is the best place to see all of the Eco-friendly products they offer. Target's Eco-friendly page breaks items down into categories like "Home Essentials," "Kitchen + Dining," and "Apparel + Gear." Under Home Essentials, for example, you will find many bedding sets, pillowcases and other bedroom/bathroom needs made from natural materials, bamboo and 100% organic cotton. From baby clothes to water filters and cookware products, reusable bags and home decor made from recycled materials, Target is offering some great, green solutions that won't break the bank. Next time you go to make a purchase from a department store, consider what you can do for the environment by choosing to shop at Target. You can go green and save: stay on Target! This entry was posted in Green News and tagged appliances, easy green solutions, going green, green clothing, organic cotton, reusable bags, sustainability, sustainable living on August 31, 2009 by Megan McLaughlin.